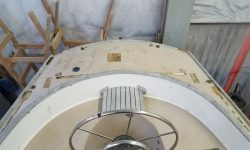 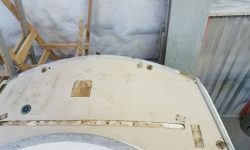 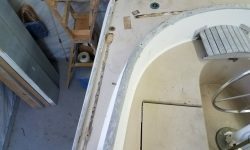 I continued work on hardware removal, this time with the farthest-aft reaches of the starboard quarter. 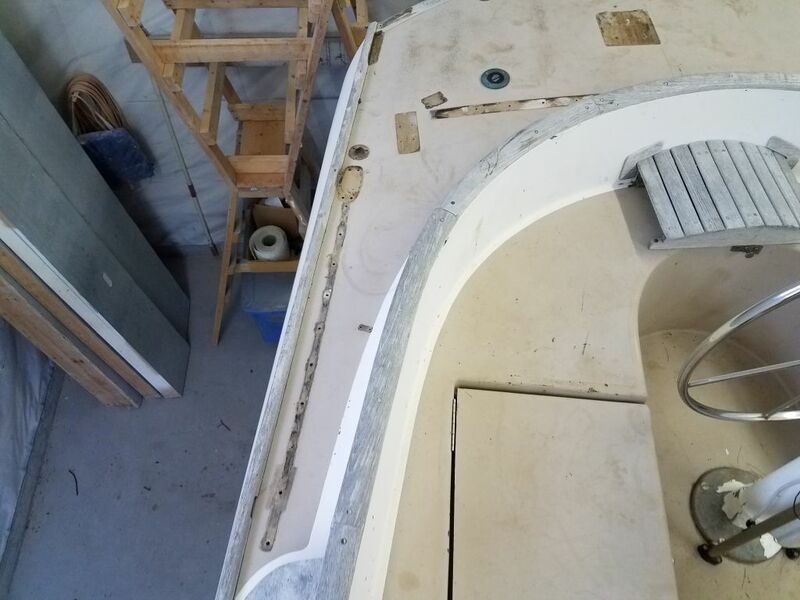 On this side, access towards the transom was somewhat better: although there was a glassed-in fiberglass fuel tank in the space, there was not the tall, skinny bulkhead that impeded the port side of the boat, and I could more easily get aft to reach the various fasteners–including those towards the center of the wide poop deck, such as the mainsheet traveler and a sort of pole socket mounted nearby. 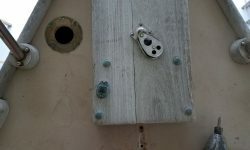 I spent quite some time in the locker removing all the nuts I could from beneath, which fortunately was most of them. 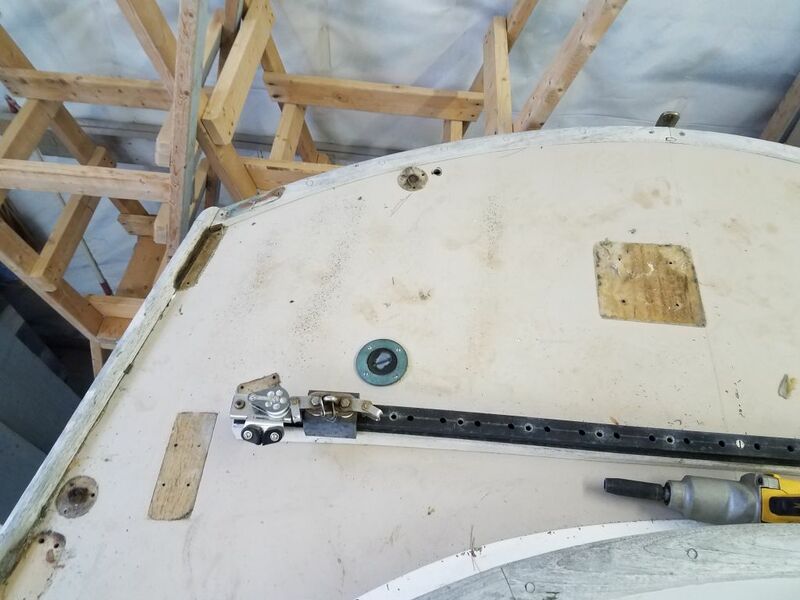 I figured I might as well finish off the space, so I removed all the nuts from the two sections of genoa track (the forward section continued into the main cabin, and I’d finish that part later) and anything else I’d need to remove. 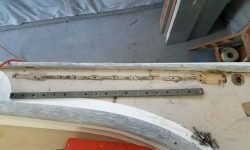 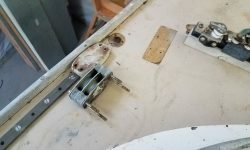 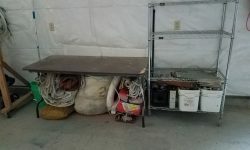 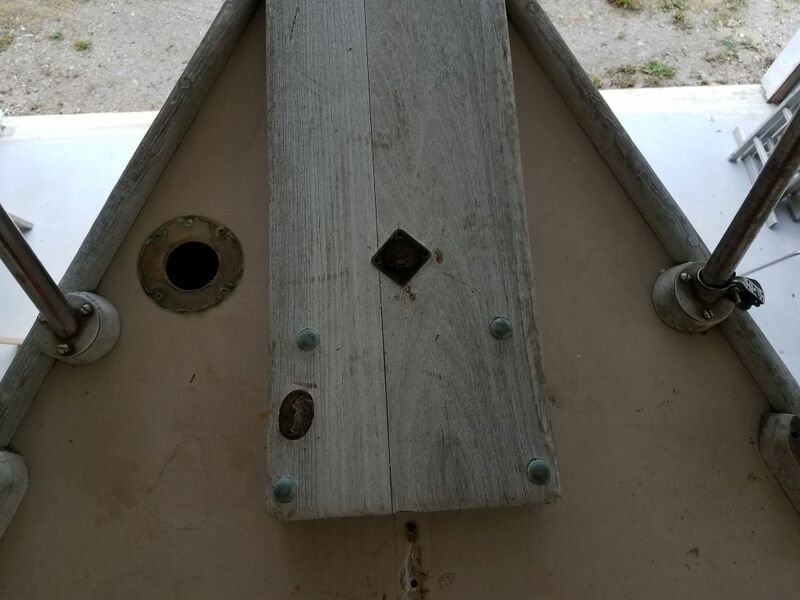 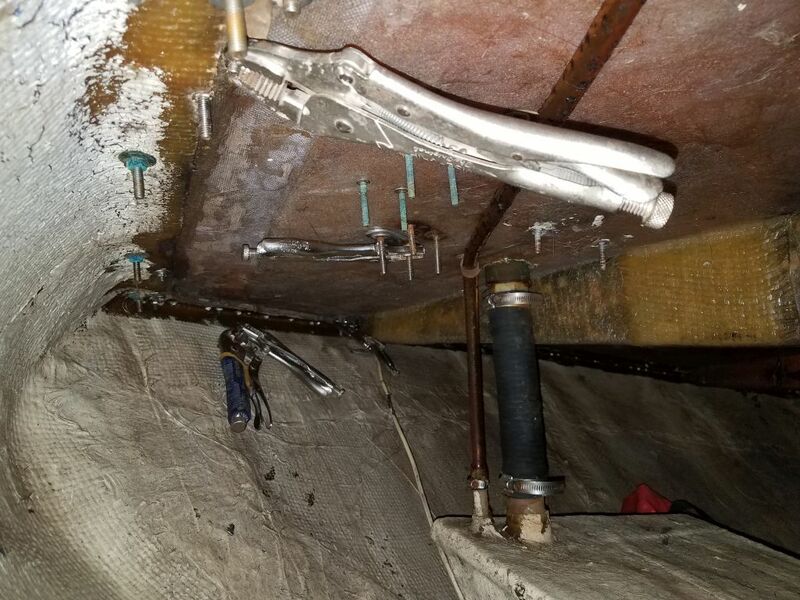 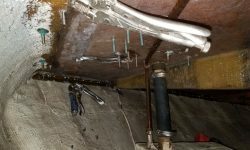 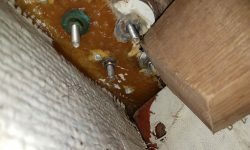 Where necessary, I installed Vice Grips on the few nuts that I couldn’t get from beneath, and then, from on deck, I could remove those fasteners from above. 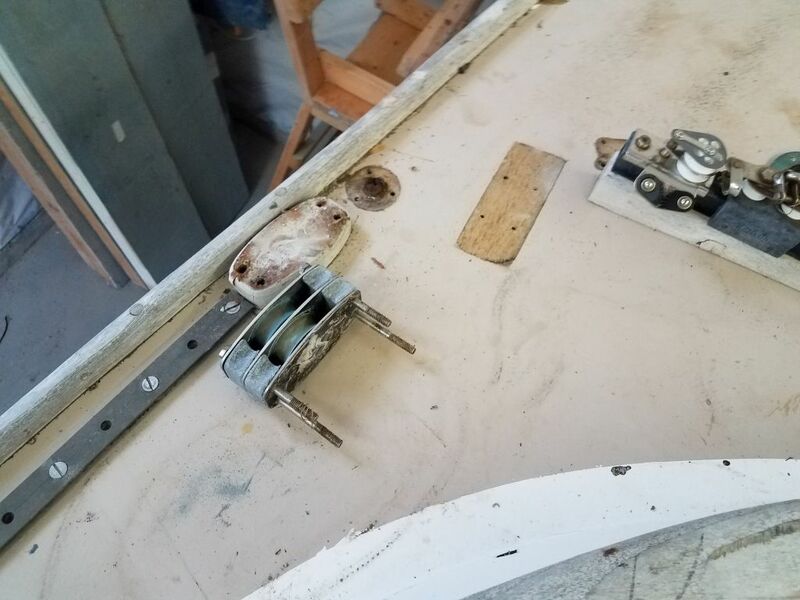 The double turning block on this side was even tougher to remove than its counterpart to port, as the stainless fasteners were truly rendered immobile by saltwater corrosion and reaction with the aluminum blocks. 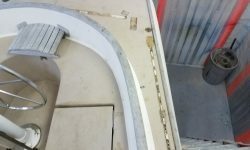 Using the electric impact gun and socket, I managed to slightly free two of the fasteners. 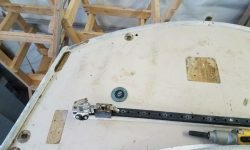 A third broke off at the head, and the fourth, seen here, barely moved at all despite full power on the gun. 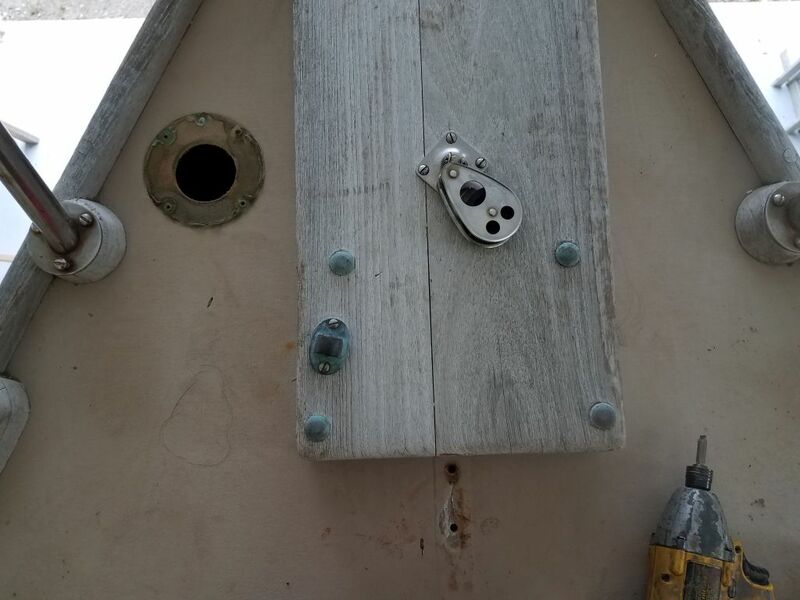 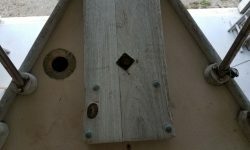 Later I was able to pry the block–fasteners and all–up off the deck successfully. 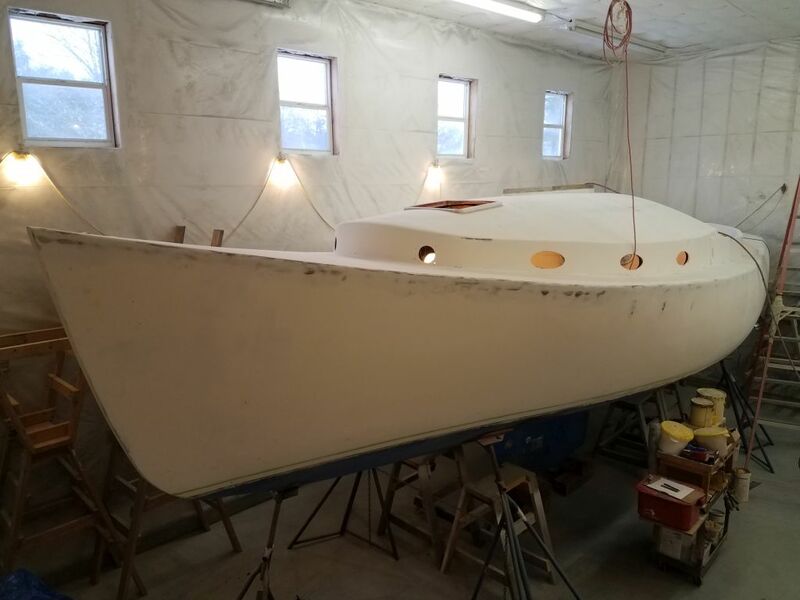 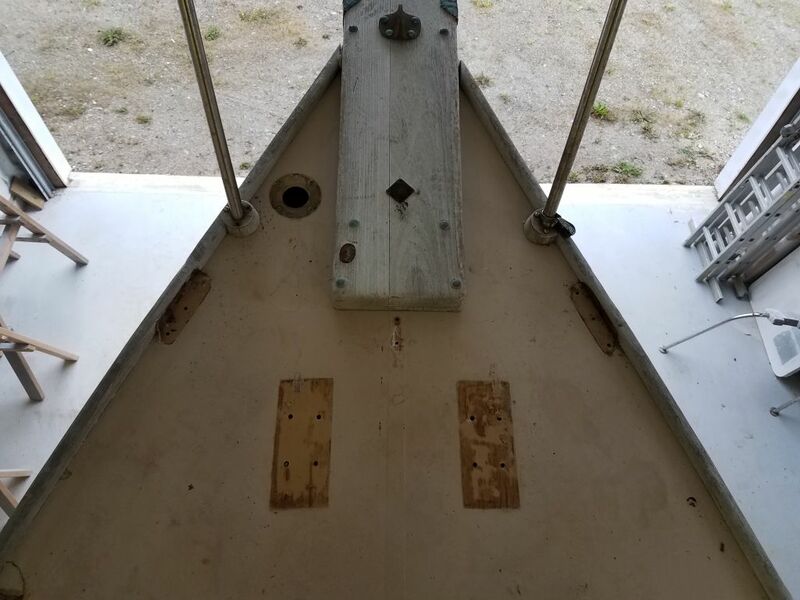 Afterwards, I returned to the port side and removed the genoa track nuts and the remaining mainsheet traveler fasteners that I hadn’t been able to access from the other side, allowing me to remove at last all the hardware from this area. 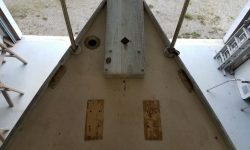 At the bow, a few things remained that I could remove now, including some small hardware on the aft end of the teak bow platform, and the wooden blocks over which the chocks and cleats had been installed. 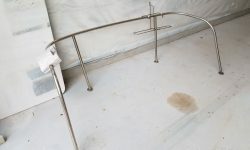 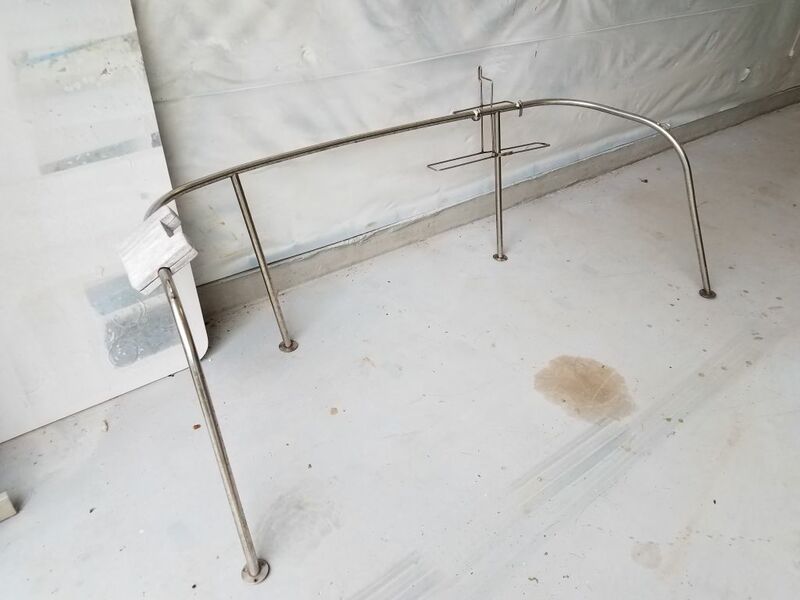 The two after mounts for the bow pulpit were proving to be a challenge. 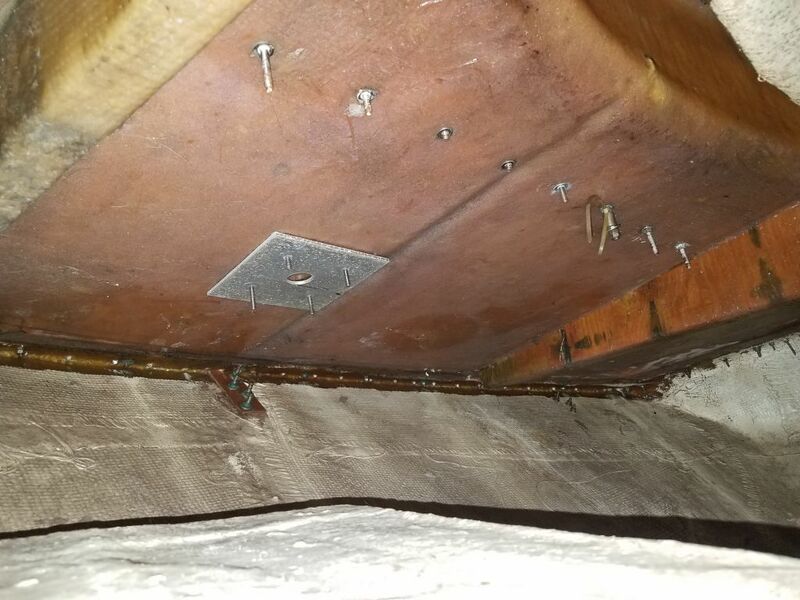 Access from below was difficult in part because of a small opening into the chainlocker, but also because there was a tall and wide wooden backing block for the after platform bolts spanning the space from side to side, and this deep blocking blocked ready access–visual or otherwise–to the fasteners securing the pulpit bases. 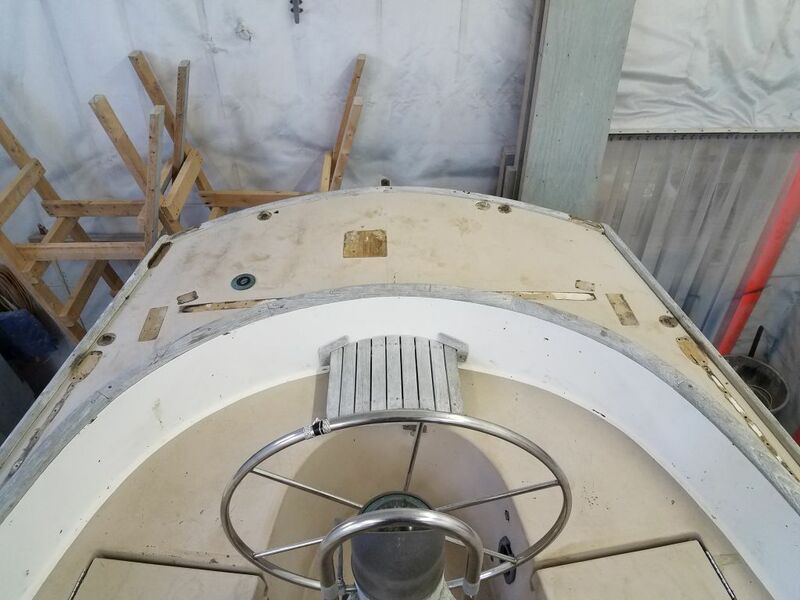 On the port side, I managed to loosen the nuts without much difficulty (other than working blind and in a contorted position), since the nuts weren’t tight to begin with. 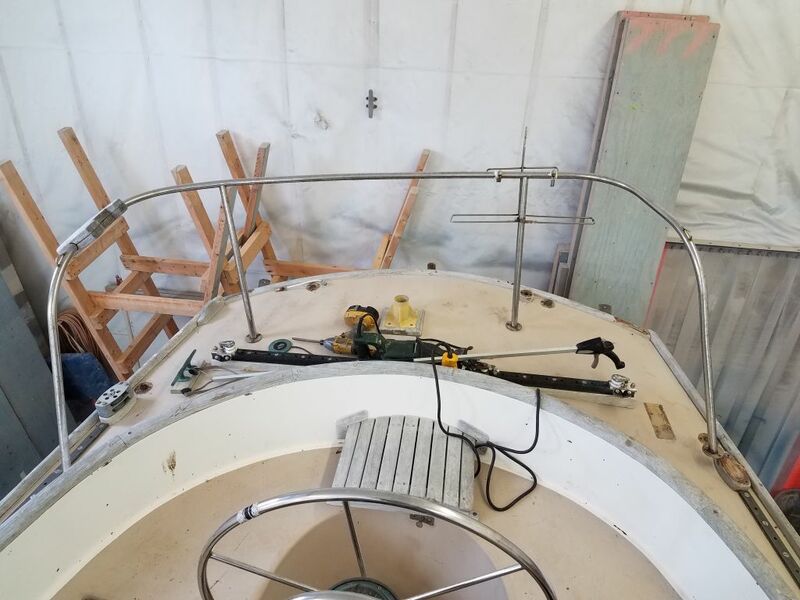 But to starboard (shown here), the angle was such that I couldn’t easily get any sort of tool on the nuts, and while the view looks clear in the photo, the realities of the access were significantly more challenging. 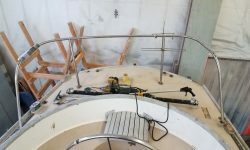 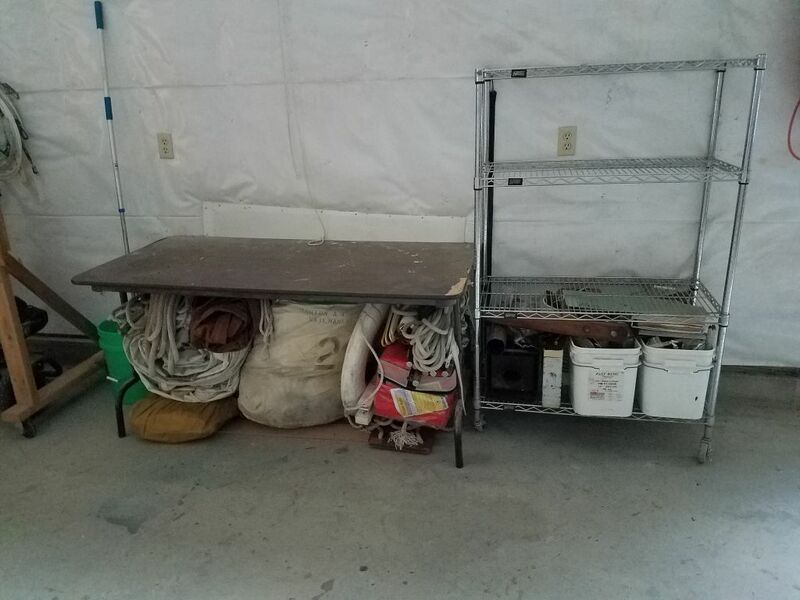 Since at least for the immediate moment I didn’t plan on removing the bow platform–I’d leave this pending final determination of the project scope–removing the backing block/beam wasn’t possible for now. 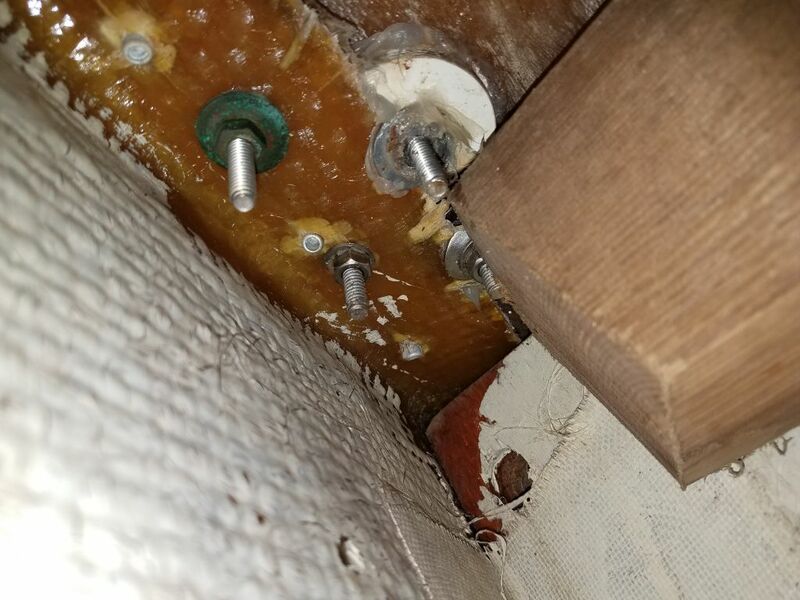 As of this writing, further action on these fasteners was pending. 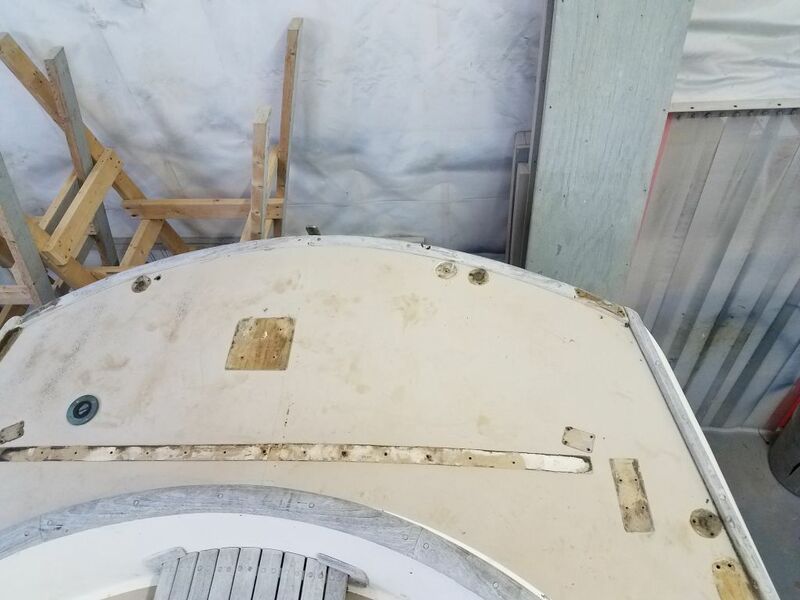 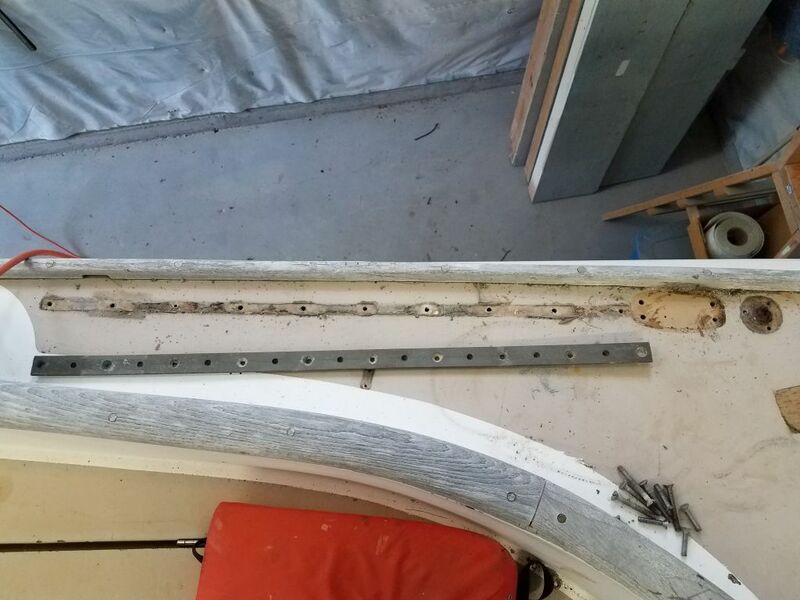 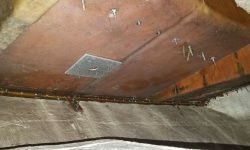 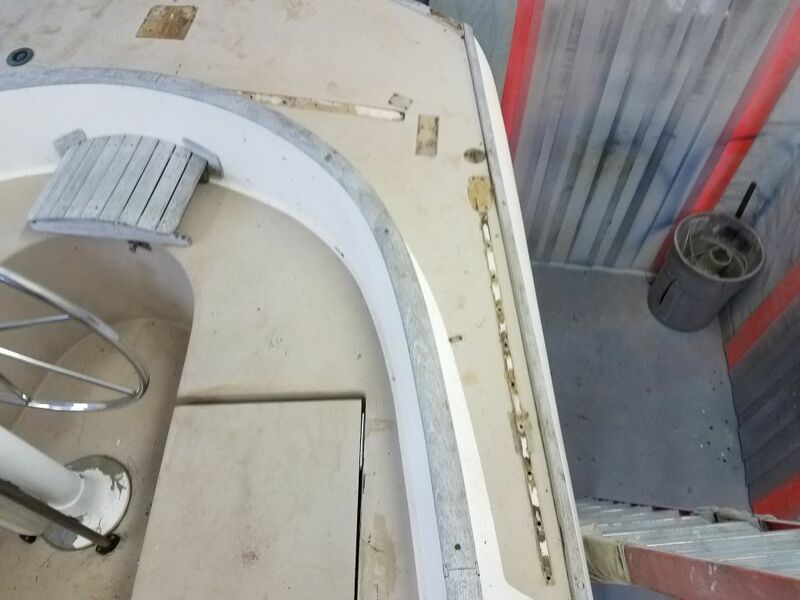 Other than the pulpit, and the two forward sections of genoa track–which fasteners I’d need to access from inside the cabin, outside the edge of the overhead liner–the hardware removal was mainly complete.